The B&H Kit includes Lorex's LNR400S Series 16-Channel 4MP NVR with 3TB HDD, along with twelve 4MP outdoor night vision dome cameras. This kit enables you to record from and manage up to sixteen cameras. The recorder comes with a preinstalled 3TB HDD. Storage is expandable to 12TB. The included 4MP dome cameras are each equipped with a 2.8mm fixed lens that delivers a 101° horizontal field of view. The cameras are IP66 rated for outdoor use. 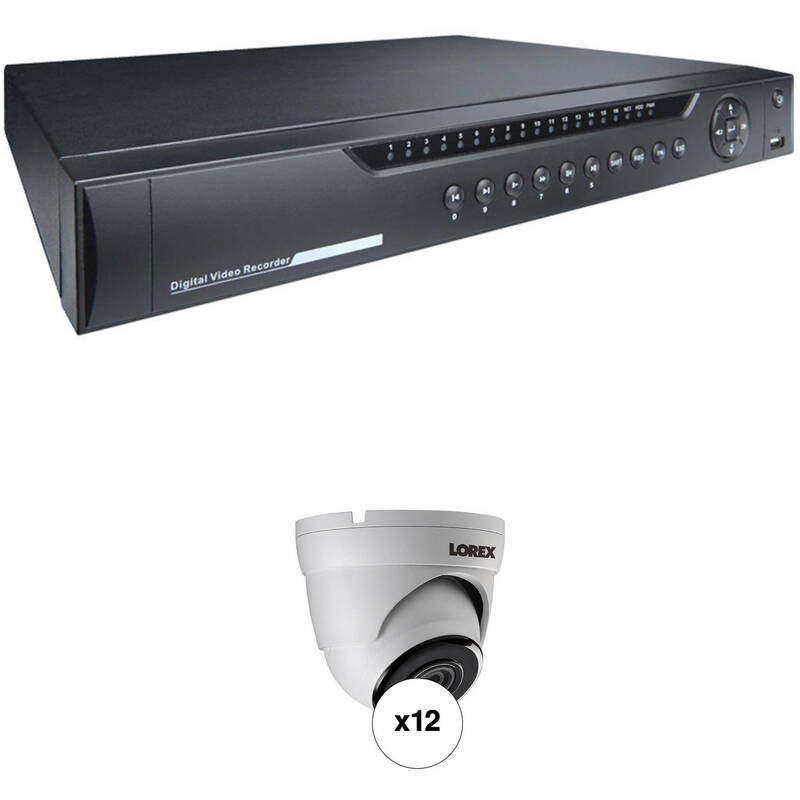 Manage and record from up to 16 network cameras with the LNR400S Series 16-Channel 4MP NVR with 3TB HDD from Lorex. This network video recorder features 16 channels with PoE and up to 4MP recording resolution. It has HDMI and VGA video outputs to connect to a monitor and display a live view in up to 1080p resolution. Additionally, the NVR offers full audio capabilities with RCA input and output interfaces. The NVR can record by hour, by day, by recording mode, by motion, or by channel. Furthermore, Pentaplex operation allows for simultaneous viewing, recording, playback, backing up, and remote monitoring. All recordings are compressed using H.264 and MJPEG codecs to maximize your storage and conserve bandwidth and saved onto the preinstalled 3TB HDD. With FLIR Cloud connection you can view live video and access the NVR from a web browser or via the iOS and Android apps. Note: This NVR is compatible with Lorex by FLIR wired PoE network cameras only and is not compatible with third-party cameras. Monitor your surroundings with the 4MP Outdoor Network Dome Camera with Color Night Vision 3-pack from Lorex. The cameras capture 2688 x 1520 resolution video at 20 fps. They each have a 2.8mm fixed lens that delivers a 101° field of view and up to 90' of night vision in complete darkness. The cameras are housed in IP66-rated enclosures that are suitable for outdoor use. Box Dimensions (LxWxH) 17.6 x 16.7 x 6.6"
Box Dimensions (LxWxH) 8.9 x 5.8 x 5.65"